More than 1800 sociologists have signed the statement. Please keep sharing and spreading the word to your networks! For Twitter posts, use the #socforjustice hashtag. To view the most recent list of signees, scroll through the embedded document below. Add your name to the list of 1800+ sociologists who have expressed support for the statement below. The recent events in Ferguson, Missouri, emerge from deeply ingrained racial, political, social and economic inequities, amongst which include a broad-based problem with the administration of policing in the U.S., particularly within black communities. As citizens and a collective of more than 1800 sociologists, we are troubled by the killing of Michael Brown. We are troubled by the excessive show of force and militarized response to protesters who rightfully seek justice and demand a change in the treatment of people of color by law enforcement. We urge law enforcement, policymakers, media and the nation to consider decades of sociological analysis and research that can inform the necessary conversations and solutions required to address the systemic issues that the events in Ferguson have raised. The relationship between African Americans and law enforcement is fraught with a long history of injustice, state violence and abuse of power. This history is compounded by a string of recent police actions that resulted in the deaths of Michael Brown (Ferguson, Mo. ), Ezell Ford (Los Angeles, Calif.), Eric Garner (Staten Island, N.Y.), John Crawford (Beavercreek, Ohio), Oscar Grant (Oakland, Calif.), and the beating of Marlene Pinnock (Los Angeles, Calif.) by a California Highway Patrol officer. These events reflect a pattern of racialized policing, and will continue to occur in the absence of a national, long-term strategy that considers the role of historic social processes that have institutionalized racism within police departments and the criminal justice system more broadly. Law enforcement’s hyper-surveillance of black and brown youth has created a climate of suspicion of people of color among police departments and within communities. The disrespect and targeting of black men and women by police departments across the nation creates an antagonistic relationship that undermines community trust and inhibits effective policing. Instead of feeling protected by police, many African Americans are intimidated and live in daily fear that their children will face abuse, arrest and death at the hands of police officers who may be acting on implicit biases or institutional policies based on stereotypes and assumptions of black criminality. Similarly, the police tactics used to intimidate protesters exercising their rights to peaceful assembly in Ferguson are rooted in the history of repression of African American protest movements and attitudes about blacks that often drive contemporary police practices. It is clear from the intensity of the protests and data on the inequities that characterize life in communities such as Ferguson that greater attention to the conditions (e.g., joblessness and political disenfranchisement) that have contributed to the marginalization of residents is necessary. Focused and sustained government and community attention on these issues is required to bring about healing and a change in the economic and political structures that have thus far ignored and left many in such areas vulnerable to police abuse. As the residents of Ferguson have demonstrated, protests often serve as one of few avenues for expressing anger and frustration with the prevailing social order. 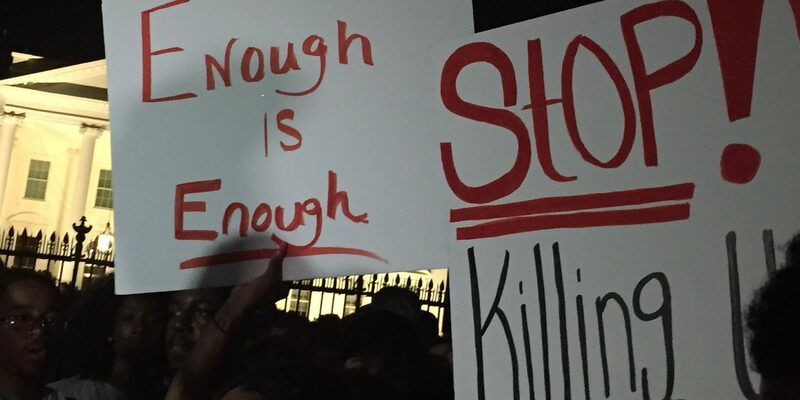 The protests have provided an immediate channel for voicing the collective grief of the community, and for demanding justice and challenging media narratives. There are no short cuts to addressing systemic problems. However, as our nation again confronts the reality of race within the criminal justice system, we urge the following actions to facilitate an appropriate response to the death of Michael Brown, and to begin moving toward addressing the systemic racialized police practices that devalue and threaten black lives. Immediate assurance from law enforcement authorities in Missouri and the federal government that constitutional rights to peaceful assembly and freedom of the press will be protected. A civil rights investigation into the incidents related to the death of Michael Brown and general police practices in Ferguson. The establishment of an independent committee to study and analyze the failures of the policing efforts during the week following Michael Brown’s death. Ferguson residents, including leaders of grassroots organizations, should be included on the committee throughout this process. The committee must provide a clear roadmap for resetting community-police relations in a way that grants oversight power to residents. An independent comprehensive national study of the role of implicit bias and systemic racism in policing. Federal funding should be allocated to support police departments in implementing the recommendations from the study and ongoing monitoring and public reporting of key benchmarks (e.g., use of force, arrests by race) and improvements in police practices. Legislation requiring the use of dash and body-worn cameras to record all police interactions. Data from these devices should be immediately stored in tamper-proof databases, and there should be clear procedures for public access to any such recordings. Increased transparency of public law enforcement, including independent oversight agencies with guaranteed full access to law enforcement policies and on-the-ground operations; and more streamlined, transparent and efficient procedures for the processing of complaints and FOIA requests. Federal legislation, currently being developed by Rep. Hank Johnson (D-GA), to halt the transfer of military equipment to local police departments, and additional legislation to curtail the use of such equipment against domestic civilian populations. Establishment of a ‘Ferguson Fund’ that will support long term strategies grounded in the principles of social justice, systems reform and racial equity to bring about substantial and sustained change in Ferguson and other communities facing similar challenges. In conclusion, we stand in solidarity with the people of Ferguson, Los Angeles, New York and throughout the country who demand justice. We encourage our colleagues and fellow citizens to support Black Lives Matter, an on-the-ground non-profit initiative committed to sustaining social action and changing the leadership in Ferguson. Additionally, we urge media to draw on a broad range of experts in their reporting of the events and call on educators to use the upcoming school year to open a space to discuss these issues. To view the list of signees, scroll through the embedded document above. If you’re a sociologist and want to add your name to the to the list of 1800+ sociologists who have expressed support for the statement, click here. When police are given special rights and priveleges, held to a different standard by the law, is this not a characteristic of a police state? citizens, just as teachers are under the authority of elected school boards. On my radio show CityWatch on WBAI 99.5FM i have been having shows on Ferguson and the Murder of Eric Garner in Staten Island NY. The policeman can be clearly seen coming from behind and choking Mr. Garner to death. The US policy in the Middle East seems to be the same as is the militarization of the police at home. Petitions re great but direct action is even more important. The killer police must be locked up. how can we add our name ? I support this statement and wish to add my name. Please add my name to the statement. How can we view the list of those who have signed, and how can we add our name? I sign my name in support of this statement. This statement is both proper and necessary. I support it 100%. I sign my name and fully support this effort. Just so people know (since there are some comments to this end), there is a link just under the window displaying the .pdf document of the letter that allows you to sign the letter if you haven’t already. I’m interested to see how many people have signed it by Monday! I sign my name in full support of efforts to bring justice and transparency to the murder of Michael Brown and issue of Black men being murdered by predominantly white law enforcement, security officers, and other capacities acting under the ageist of maintaining white supremacy. How can i add my name. I fully support this statement and the actions called on from it. But I also maintain that working at the national level is not enough, there are nearly 1,200 sociologists and criminologists in support of this letter in what I’m sure are hundreds of communities. I’m calling on this collective for a concerted effort to develop and identify tools and resources that we can use to approach and work with our local law-enforcement agencies at a grass-roots level to address local policing practices that perpetuate institutionalized racism. Working from the national level downwards and the community level upwards, in conjunction, will maximize our chances for achieving holistic and systemic change. I strongly support this statement. Pingback: Conditionally Accepted | But, Do #BlackLivesMatter In Academia? Dr. Glenn S. Johnson, Ph.D. I support the statement 100 percent.